This is a great summer salad, that has a nice mix of differently textured colorful ingredients. I highly recommend using fresh corn, the difference in taste is amazing! You can prepare the corn ahead of time if you need too (Step 1). Also, there’s enough lime juice in the salad to keep the avocados from turning black after cutting, but I would still add them as close to eating time as possible. 1. Cut the corn off of the cob. Spread the corn in a 9×13 pan. Broil in the top rack of the oven for 8-10 mins, stirring constantly (every 1-2 mins). The corn is done when it beings to turn black. 2. 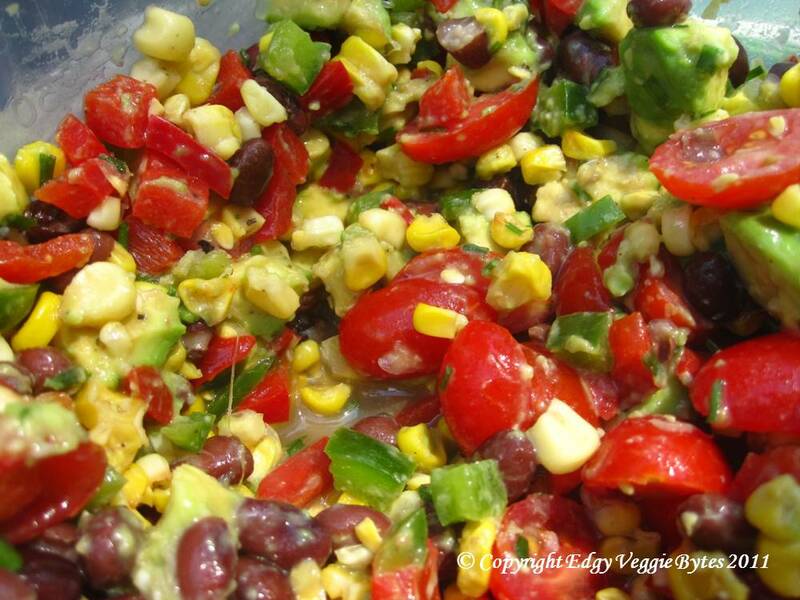 In a large bowl, mix the corn, black beans, lime juice, chives, tomatoes, red and green bell peppers, salt, and pepper. Refrigerate until ready to serve. 3. Right before serving, gently mix in the avocado.